Goalkeeper Niall Morgan's three points helped Tyrone hold off a Donegal side that finished with 13 players in the Division 1 clash at Omagh. The match had two key moments with Donegal's Michael Murphy sent off for a second yellow card after seeing his first-half penalty saved by Morgan. Stephen O'Neill's second-half goal then came against the run of play to put the Red Hands 1-7 to 0-6 ahead. 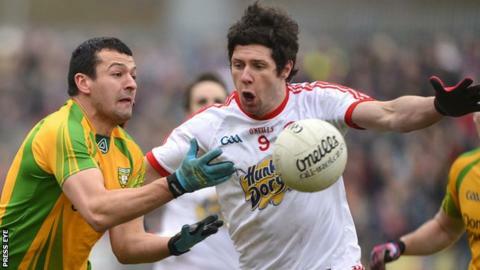 Donegal's Neil Gallagher was dismissed late on as Tyrone deservedly held on. The All-Ireland champions would have moved into a one-point lead in first-half injury-time had Murphy converted his penalty but Morgan stretched to save and the ensuing scramble to win possession resulted in the Donegal star being handed a red card. Murphy appeared to receive his second yellow for his challenge on Justin McMahon who had dived bravely to win the ball. A number of players got involved in afters and once order had been restored, Murphy received his marching orders. Donegal started with 13 of their All-Ireland Final line-up in a team that showed two late changes to the published line-up with Martin McElhinney and Ross Wherity replacing Declan Walsh and Patrick McBrearty. Goalkeeper Niall Morgan on helping Tyrone beat All-Ireland champions Donegal by saving a penalty and scoring four points. Morgan had notched Tyrone's opening point from a 45 and the score helped the Red Hands move into a 0-3 to 0-1 advantage. Early on, Donegal were attempting a long-ball tactic to the full-forward line with regular midfielder Gallagher operating on the edge of the square. Donegal hit three of the next four scores - all courtesy of Murphy - to level before another long-range Morgan placed ball and a fine Ronan McNamee effort put Tyrone two up again. Then came the penalty incident in first-half injury-time and Murphy's subsequent dismissal. Despite being down to 14 men, Donegal made the better start to the second half as scores from Leo McLoone and Anthony Thompson reduced Tyrone's lead to 0-7 to 0-6. But then came the second big moment of the match as O'Neill netted from close range after he latched onto an attempted long ball from McNamee which had been half blocked. As Donegal became increasingly frustrated by the turn of events, Morgan was among the Tyrone scorers during a period of Red Hand superiority which pushed their lead to 1-11 to 0-7. Donegal reduced Tyrone's lead in the closing 15 minutes but without ever looking like getting on terms. Gallagher was dismissed late on after getting his second yellow card for a foul on Sean Cavanagh.